Chocolate Covered Strawberry Smoothie–A delicious, sweet and healthy treat! Carisa here and I am excited to share a quick and easy kid favorite that is very healthy! I love giving my kids treats that are good for them and we are addicted to smoothies. This is a unique take on a classic treat: the chocolate covered strawberry… the frozen fruit makes this smoothie so creamy and sweet without having to add any sugar! See?? Totally healthy! I feel like it should be spring already! I have been craving some fresh berries. Unfortunately strawberries out of season just aren’t that good. It’s a good thing frozen berries are delicious and full of flavor! This is a great way to satisfy the sweet berry cravings. We spread a little bit of melted chocolate in our glass before filling it up with smoothie and chocolate gets smooth, creamy and so rich. I would only add the extra chocolate chips for special occasions… but who gets to decide what a special occasion is!? 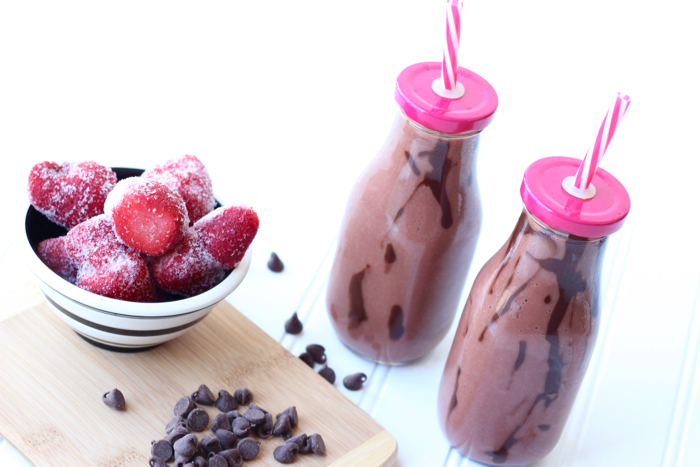 Chocolate Covered Strawberry Smoothie--A delicious, sweet and healthy treat! Combine almond milk, frozen bananas, strawberries and cocoa powder in a blender. Blend until smooth. Warm milk and chocolate chips in the microwave and mix until smooth. Dip a spoon in the chocolate and spread a little chocolate on the glass cup. Then pour the smoothie in and drink up with a straw! I’m a smoothie girl and this one looks so delicious, I’ll be giving it a try. Your pictures are great and so is this recipe! Found you via FoodieFriDIY! These look delightful! Rich and filling without being too rich. Thanks for dropping by the Best of the Blogosphere linky party! Looks yummy. Pinned & shared. Thanks for joining the Inspiration Spotlight Party.